Thanks! Maybe there is only inch thick arch board material. 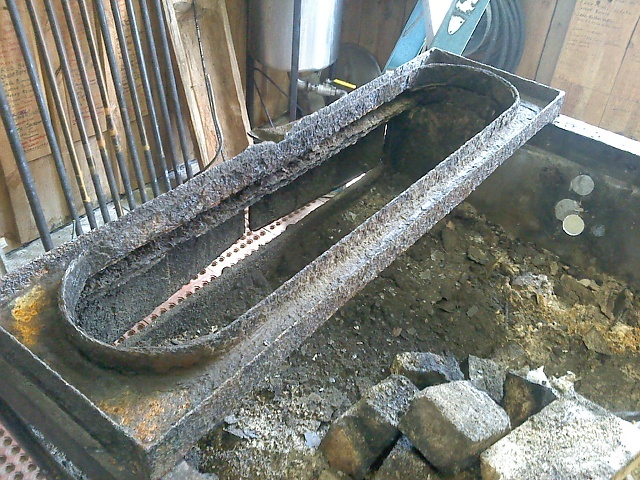 If so I may use that and then splits (1 inch thick) bricks for the liner. I got into the arch work a little more this afternoon and evening. Can you say DISASTER! It just keeps getting worse. I guess I shouldn't complain the arch has served me well for 20 years with out much love! The arch is probably about 100 years old. So I will cut it some slack. 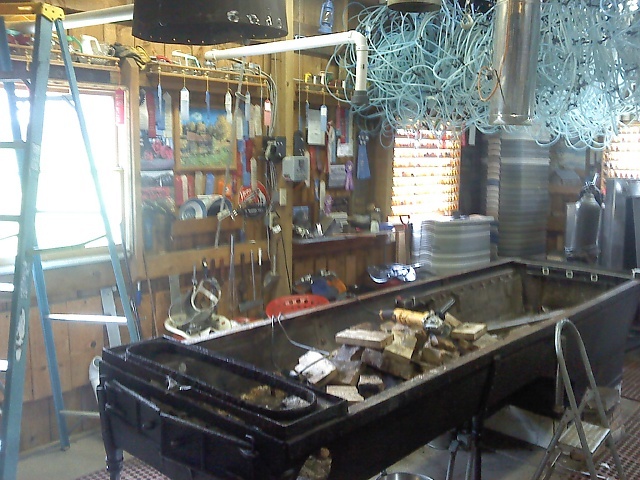 I got the steamaway out of the evaporator room and into the wood shed. Suspended it with a couple ratchet straps. 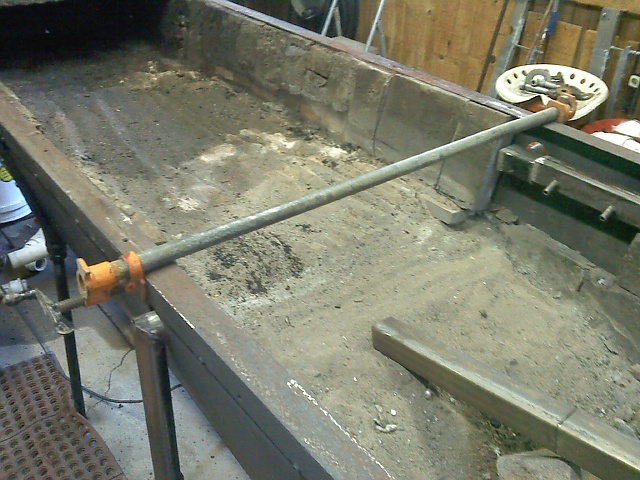 Then brought the cart back in and lowered the rear pan on to it and out the door. Now we have some room to work. 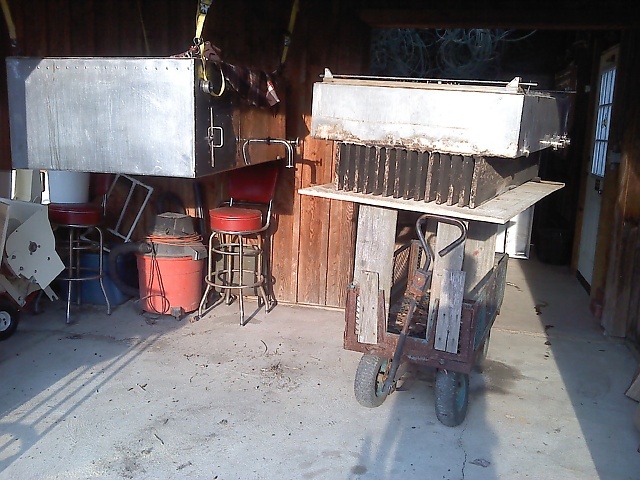 This is just one of my old wood carts that I have the pan balanced on. What could go wrong? Started squeezing the rails back together. removed all the side brick and splits under them. Found that the left rail is just about shot. several rust spots. You would think this stuff would last more than 100 years! I pulled it in to the dimension and realized that just one rail was moving. The rusty one. I think I may be due for new rails! Just another thing added to the list. Started to look at the issues associated with new rails. Well they should go back under the stack collar. Began to lift the exterior skin of the stack to expose the base stack.Of course it caught on the stack thermometer and destroyed that too! This base stack was made from 400 series and it has some warping and surface rust. 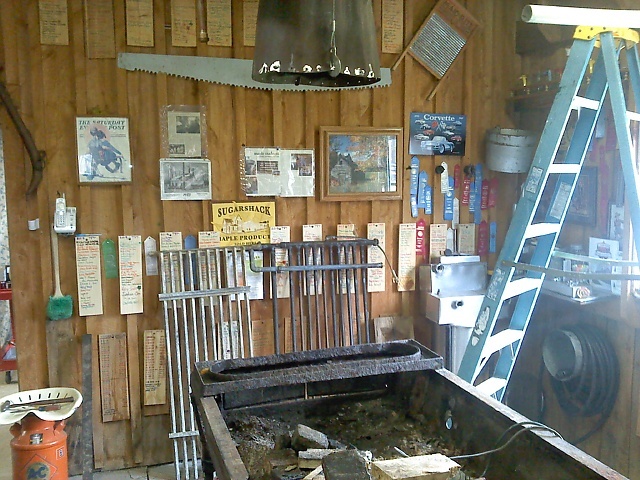 We fired it way to hot several times when I had to old pans and we were burning pallets! All in all not too bad for 20 years. So I need to figure out how to gently unfasten and lift the cast stack base, remove the old rail/s and insert new ones. That should be enjoyable! I think I will wheel barrow out the old bricks and sand and start fresh. Wife thinks its telling me I should be done making syrup! Wait what was the initial objective. Yea replace the rail gasket! Looking more like a summer project! Last edited by Sugarmaker; 04-18-2019 at 08:27 PM. 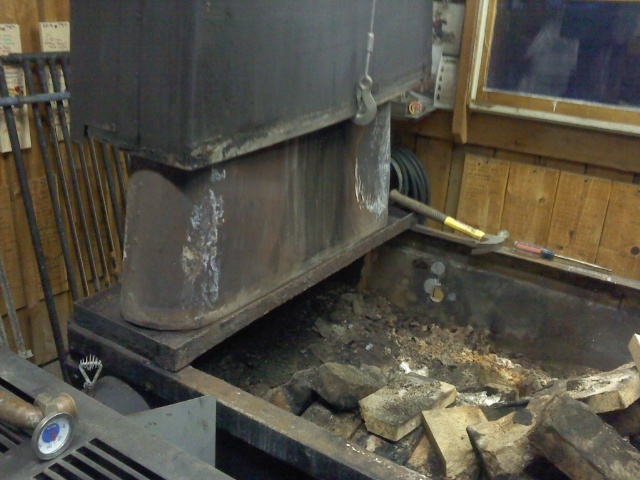 Chris: It looks like your pipes are going to go through to the back of evaporator. That's how I did mine. Just built a manifold across the back. Also wrapped them in ceramic insulation . I've used arch board and ceramic blanket respectively behind the fire brick in my last two cookers. Arch board is a little easier to work with, but it's WAY more expensive. I bought certain blanket from McGill's warehouse online for my new cooker. I think I paid $140 for enough to do a 4x14. I priced arch board and it was gonna be like $700. I talked to several guys who'd used it behind their bricks and I was convinced to give it a shot. I would definitely go that route again if I ever tear this rig apart. Finally had time to get some pictures on. 4" ball valves, less air leaks and quieter too! Sorry about the last picture, can't seem to get one to be turned the right way. Thanks The pictures help too! My air tubes are going to come out the side of the arch about midway back along each side. I haven't priced the arch board. That sounds a little pricey! I found Bascom's has 1 x 3 feet x 1 inch for $12 each plus shipping. They have 16 in a box. I think I would need a box to complete the project on a 3 x 10 arch. Might use some in back of the front casting and maybe in the insulated door too. So that would be $200 plus shipping! Then fire bricks and mortar. Last edited by Sugarmaker; 04-21-2019 at 07:38 PM. The saga continues as I find more issues with the old King Arch. It needs more repairs than I thought. But most are sturctural and or safety related. So we will continue to plod along. I got the rails removed today. Took the lower portion of the base stack off and found it had some holes and thin areas. 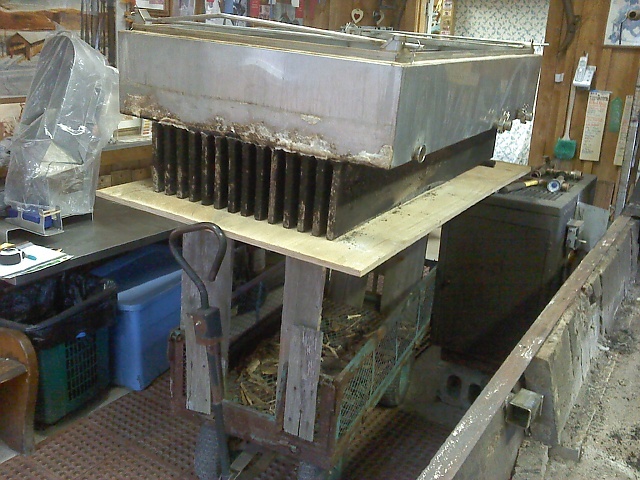 Will check with local maple fab shop on getting a new one. Also the stack base is getting rusted and thin. I will have him quote a replacement for that too. I did contact a local company about the arch board bricks and mortar. May be able to get everything there? If I needed to get the arch board from Bascom's I think I would only need 9 or 10 pieces.